The Mayan civilization is one of the ancient world civilizations, that bloomed in central American continent, about two Millenniums before the common era and continued up to end of first Millennium., till arrival of Spanish invaders. It had fully developed written language of the pre-Columbian Americas, and is famous for its art, architecture, and mathematical and astronomical systems. This civilization reached its peak during the Classic period. (c. AD 250 to 900) Mayans had developed a long period calender known as Mesoamerican Long Count calendar, which was used in Central America prior to the arrival of Europeans. Mayans had predicted, based on this calender, end of the world; an apocalypse with cataclysmic or transformative events to occur on a day, which works out according to Gregorian calender, as on 21st December 2012. These Apocalyptic predictions have provoked widespread fears among believers, all over the world including in China. The prediction says that the apocalypse shall begin with three days of darkness. This has made such profound impact on some Chinese believers and has created such a panic that in two rural counties in China, the candles are totally sold out. 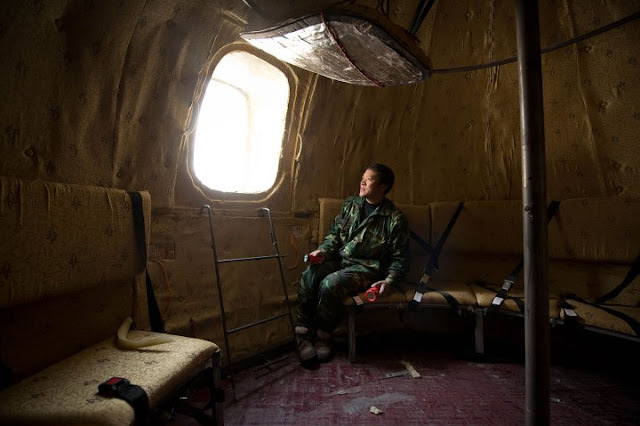 A man from China's northwestern province of Xinjiang, is so much afraid that he has invested all his savings, approximately $160,000, to build a survival ark, fearing that his home will be engulfed in a doomsday flood. Chinese people by nature are great businessmen, who keep looking for opportunities to make a fast buck. It is no wonder that some Chinese manufacturers have sensed great business potential even in this fear of the apocalypse. An ex farmer and now furniture maker,; Liu Qiyuan has created his own version of Noah's Ark and is willing to sell another copy to anyone who is willing to buy it. This 45 year old villager turned businessman, has created , tsunami-proof survival pods to protect the humanity from this calamity. 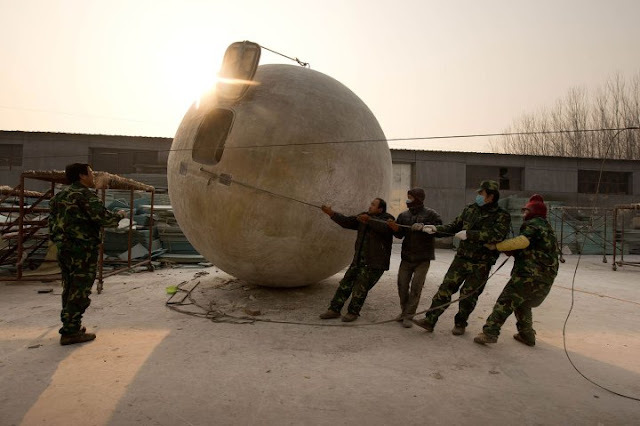 Mr. Liu says that his prods, which essentially are fibreglass spheres, can withstand towering tsunamis and devastating earthquakes. Liu Qiyuan, who has his workshop in Qiantun, which is about an hour's journey from Beijing, explains further: "The pod won't have any problems even if there are 1,000-meter-high waves... it's like a ping pong ball, its skin may be thin, but it can withstand a lot of pressure," he told AFP at his workshop in Qiantun, an hour from Beijing. Liu has so far manufactured 7 of these pods, which have a fiberglass casing over a steel frame and are equipped with oxygen tanks, food and water supplies. Each pod has cost him about 300,000 yuan ($48,000) each. Pods also are equipped with seat belts, essential for staying safe in storms. The pods are designed to carry 14 people at a time, but it is possible for 30 people to survive inside for at least two months. Liu claims that the pods have such great insulation that a person could live for four months in the pod at the North or South Pole without freezing, or even feeling slightly cold. 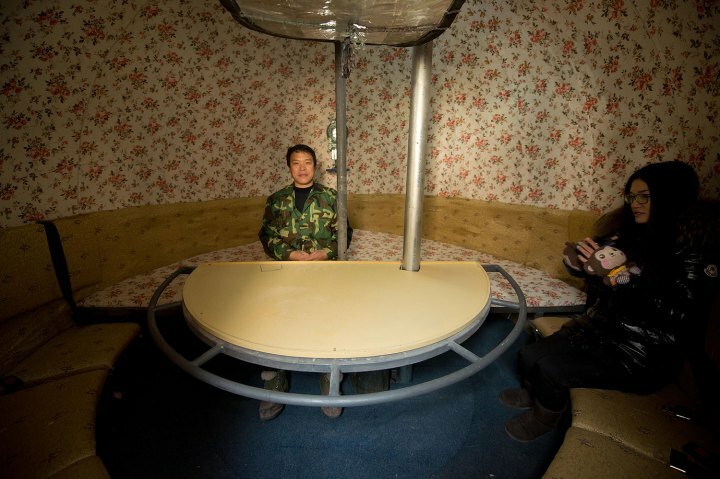 One of the spheres, probably a de-luxe version, even has the domestic comforts of a table, bed and flowery wallpaper. 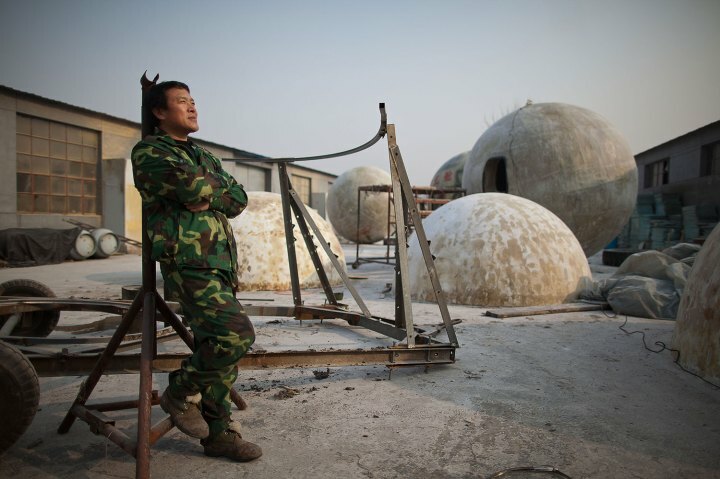 Liu first thought of spherical houses to withstand earthquakes, which occur frequently in China. In 2009 he saw a Hollywood blockbuster titled “2012” based on the Mayan theory of the end of the world and decided to switch his focus to survival technology after a tsunami. Liu is married and has a daughter. He admits that, when he made his plans public, many were and continue to be skeptical. He however went ahead and took loans from neighbors and friends to fund his workshop and manufacture the big balls. As expected, he has not sold any of his spheres so far and is now worried about repaying the loans. He is gracious enough however, when he says that for many years he has worked without saving any money and has invested everything in these pods because it is worth it. He says "If there really is some kind of apocalypse, then you could say I've made a contribution to the survival of humanity. I have invested my money in the pods because it's worth it, it's about saving lives"
Chinese authorities have been trying to reassure citizens, that the so-called end of the world is a rumour and citizens should use scientific concepts. Liu stands no chance to sell any of his sphere and recover his costs. He would probably take it in his stride and would consider it only as a business risk.